26/2/09 – Acquisition – Seville – Fondación Focus Abengoa – The Focus Abengoa Foundation has just acquired the painting of the Immaculate Conception (ill. 1) which appeared on the French art market in 1990 (Ader Picard Tajan, 22 June 1990) attributed at the time to the “circle of Diego Velázquez”. The dealer Charles Bailly, convinced that the canvas had been painted by Velázquez himself, had purchased it for 18 million French francs. It seems that the Immaculate Conception had been in France since 1870. After a remarkable restoration in London by Zahira Veliz, the painting then saw its attribution hotly debated between the two major specialists of this Spanish artist, culminating during the auction at Sotheby’s London on 6 July 1994 : Alfonso Pérez Sánchez acknowledged from the outset the canvas’ importance within the panorama of the artistic production in Seville in the 1620’s and quickly attributed it to Alonso Cano (1601-1667), a fellow artist of Velázquez in Pachecho’s workshop. Jonathan Brown, in 1994 at least, maintained the name of Velázquez in the press. Since it did not reach the reserve price, the painting was withdrawn from the sale and had not been seen since. 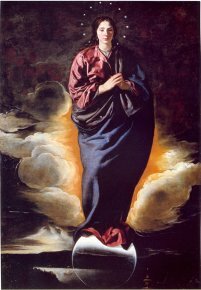 The Immaculate Conception has been hanging since 12 February in the exhibition hall of the Centro de Investigación Diego Velázquez, in the Hospital de los Venerables in Seville, the foundation’s headquarters. Created in 2007, at the time the charming Santa Rufina was acquired (for which the attribution to Velázquez seems undeniable ; see news item of 6/7/07), the center holds several 17th century Sevillian works, either acquired by the foundation or on loan from various institutions. This is the perfect setting for this canvas of exceptional quality which brings together the finest characteristics of Sevillian artistic creation in the 1620’s and treats the latest theme in Spanish religious devotion at the time. The label attributing it to “Velázquez-Cano” reflects the complexity of the possible relations between the two artists, trained in the same workshop and using the same models. An Immaculate Conception by Martínez Montañes (1568-1649), dated around 1623-1624, recalls the extent of this great sculptor’s influence for both artists, especially Cano (ill. 2). 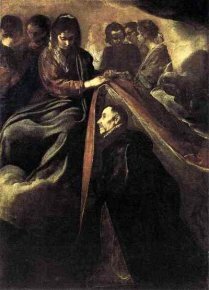 To the right of the Immaculate Conception, The Laying-on of the Chasuble on Saint Ildefonse (ill. 3), painted by Velázquez in 1623-24, strongly underscores the traits common to both works : the colours and pigments, certain facial features, the brush strokes in the background. But the very sculpted relief of the body, its proportions, its “tapered” aspect”, the more intense treatment of the light on the face, the system of the pleats, recall Cano for whom, alas, no work is exhibited in the room. Very few works of this artist’s early career survive. As scientific adviser to the Foundation, Benito Navarrete Prieto points out how the debate on the attribution remains wide open and how this type of question explains the creation of research centre which has planned a colloquium on the painting in 2010. The director of the Centre, Anabel Morillo León, stated that the purchase price was below the 12 million euros quoted in the press. Thanks to the Fundación Focus-Abengoa this painting has found the perfect home, in the admirably restored setting of the Hospital de los Venerables.